If you’re looking for the perfect bedding, you can’t go wrong with adding the Holy Lamb mattress topper, volume - support, and comfort— this mattress topper has it all. At Satara Home & Baby, we pride ourselves on our selection of high-quality and all-natural bedding and bed linen. 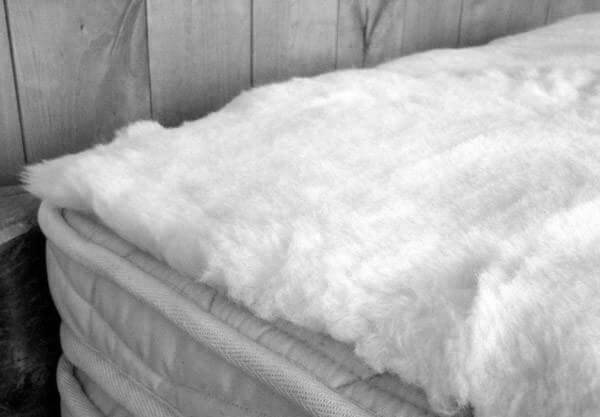 The Holy Lamb Fleece mattress topper is one of our top products. A mattress topper is designed to be placed on top of a mattress to add softness to your mattress. The right kind of mattress topper can make all the difference if your mattress feels too firm. Many luxury hotels have mattress toppers on their beds to ensure that their guests have a restful sleep. Premium Eco-Wool™: Holy Lamb Organics, the company that makes Holy Lamb mattress toppers, uses local wool sourced from its Sustainable Wool Program and imported certified organic wool. Premium Eco-Wool™ makes the Holy Lamb mattress topper volume generous. The tops fleece fabric weighs 33 oz per square yard, resulting in a mattress topper that can make sleeping on an old mattress feel like slumbering on a cloud. What’s more, Premium Eco-Wool is sustainably sourced and produced, so it’s a mattress topper fabric you can feel good about buying. Organic Cotton Backing: If you’re wondering what keeps the snuggly fleece of the Holy Lamb mattress topper volume in place, the answer is organic cotton backing. The lamb’s wool blend, which makes the Holy Lamb mattress topper so exceptional, is woven into threads made of clean, high-quality cotton harvested from organic farms. Unlike conventionally grown cotton, organic cotton is free from pesticide and fertilizer residue. It’s grown according to strict agricultural standards, and organic cotton farmers use natural ways to promote soil fertility and keep away pests. To produce cotton fabric, conventional cotton is processed with potentially harmful chemicals, bleached white using chlorine, and finished using synthetic surfactants and even formaldehyde. To create great bright colors, it’s often dyed with pigments that contain heavy metals. To summarize, the organic cotton backing used to hold the fleece on the great Holy Lamb mattress topper volume together is better for the environment and your health. Moisture-Wicking Properties: Since the Holy Lamb mattress topper is made of wool, it naturally has excellent moisture-wicking properties. Wool fibers draw moisture away from your skin, keeping you comfortably dry even in humid weather. Natural Insulation: The wool fibers that make the Holy Lamb mattress topper so good are naturally crimped, with tiny pockets that trap air and help create a barrier from which heat cannot escape. You won’t have to worry about feeling chilly in the middle night when you have a Holy Lamb mattress topper. Because the Holy Lamb mattress topper is created using wool, it can help you stay warm during the cold months. Consumers who care about the environment and their health would probably have a hard time sleeping on a mattress topper made from conventionally grown cotton that’s treated with toxic chemicals. If you choose a conventional cotton mattress topper, it can be difficult to rest well knowing you may be breathing in potentially toxic fumes. Do you want to go green, and buy a natural or organic mattress topper, but aren’t sure if it’s as comfortable as regular ones? Contrary to popular belief, “going organic” doesn’t have to mean settling for less comfort. Satara Home & Baby is proud to offer you green products that allow you to create a sleeping space you'll love without compromising your personal values. You’d be happy to know that the Holy Lamb mattress topper, which is made of sustainable materials, is even cozier than a standard topper. Butter-soft lamb’s wool makes up the Holy Lamb mattress topper, and the one-inch loft makes this topper feel sumptuously thick. The Holy Lamb mattress topper volume, density, loft, and unique features make it a wise choice for those who wish to improve their sleep quality. In creating it, organic and sustainable materials are used, and you can sleep even better knowing your purchase helps the environment and protects your health. Satara Home & Baby is your trusted source for the purest and most natural bedding and mattresses available. We have been helping our customers sleep healthy for more than a decade. Our store carries a wide selection of bedroom essentials, from organic duvet covers and mattress toppers to latex mattresses and solid wood beds. You can place an order online through our official website store. If you have any questions about product features, such as the Holy Lamb mattress topper, or how you can buy, please give us a call at (608) 251-4905. We love to help answer questions about how you can or learn more about our Holy Lamb mattress topper.